M0PLA/P SOTA Activations: 10th December 2016. Titterstone Clee Hill SOTA Activation. 10th December 2016. Titterstone Clee Hill SOTA Activation. G/WB-004 Titterstone Clee Hill. 10th December 2016. Titterstone Clee Hill was a fairly easy walk from the quarry except the low cloud cover was making it difficult to find the summit as I had never been here before. I found the Comms and radar station first then had remembered the summit was west of its location. So after another 2 or 3 minutes walk I found the summit. The full ascent took about 25 minutes or so. I now use the Great Outdoors GPS app and no more wondering if I am in the right location. I set up my 2M Dipole and started CQ SOTA on S20 FM and right away had a response, the QSO's came flooding in. 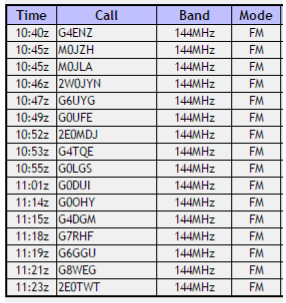 16 contacts in 40 minutes and a few of these were a 2 or 3 minute QSO's. As the weather was not great (visibility about 25 yards) I decided to ring Jamie (my son) as he didn't accompany me on this outing, just to let him know I was starting my descent and would ring him once I got back to the car in approximately 25 - 30 minutes. You can never be too careful so I thought it was a good idea. I ended up getting back to the car a slightly different route than I had climbed and it took me 30 minutes. The cloud cover was getting bad at the point so I thought I had timed my descent just about right. A quick call to Jamie and all was good to set off home.